Founder of LASIK eye surgery gets big recognition at age 89. WASHINGTON, DC: President Barack Obama has recognized a team of three IBM scientists — Rangaswamy Srinivasan, James W. Wynne and Samuel Blum — with the National Medal of Technology and Innovation, the country’s most prestigious award given to leading innovators for technological achievement. With more than a combined 100 years of service at IBM Research, they are receiving this award for designing, developing, and implementing laser technology that improves people’s health, including LASIK eye surgery. Obama will personally bestow the award to the IBMers at a special White House ceremony at a later date. IBM has earned the National Medal of Technology and Innovation on nine other occasions. IBM’s seminal work in laser technology, which began in 1981 by this team of scientists, has shaped the course of surgical care. Well suited for delicate surgeries, the excimer laser replaced mechanical instruments such as the scalpel which was not very precise, could leave the cornea permanently weakened and required a long recovery time. The team of researchers originally demonstrated this technology’s capabilities to the medical community by using quick pulses of ultraviolet light to cut a clean pattern into a human hair without burning the strand. This ability to precisely cut into materials via vaporization, rather than burning, was appealing to doctors and patients as it left surrounding areas undamaged. Today, LASIK eye surgery is the most popular vision correction surgery performed and has improved the vision of approximately 25 million people worldwide. This type of modern surgery technology is one reason why the world has looked to the United States for leadership and best practices. Wynne still works at IBM’s TJ Watson Research Center while Srinivasan and Blum have since retired. In 1981, Srinivasan discovered that an ultraviolet excimer laser can be used to etch a living tissue precisely without causing any thermal damage to surrounding area. He named it Ablative Photodecomposition (APD). In 1983, he collaborated with an ophthalmic surgeon to use APD for a surgery of the cornea. This led to development of LASIK. In 1998, he was awarded the Biological Physics Prize by the American Physical Society. Srinivasan, who was inducted into the Hall of Fame in 2002, has been granted 21 U.S. patents. 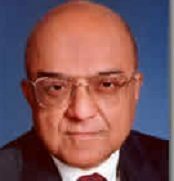 Born in India in 1929, he received both bachelor’s and master’s degrees in science from the University of Madras, India, in 1949 and 1950, and earned a doctorate in physical chemistry at the University of Southern California in 1956. He did post-doctoral work at the California Institute of Technology (1956) and at the University of Rochester (1957-61). Many societies have honored Srinivasan for the discovery of APD. These also include the American Chemical Society (Creative Invention Medal – 1997), ACS North East Section (Esselen Medal – 1997), and the U.S. Patent Office (Innovation in Technology – 2002). He was elected to the National Academy of Engineering in 1999.